I finally got around to reading the 700+ page conclusion to the Magicians and Mrs. Quent trilogy. I like to read books by the season. The first one I read in the dead of winter, the second in the middle of summer, and I planned to save the third for the long fall evenings. I started it in October, a perfect time for reading about eerie primeval sentient forests. But then work compilations, back-to-back illness and a busy holiday season threw my reading schedule way off track. This book proved the perfect antidote to all the stresses in my life. The story opens with an extended flashback to a Neolithic Britain and the origins of many of the series' central elements: the arrival of the planet Cerephus and the Ashen, the first magicians, the true nature of the Wyrdwood and the first women who spoke to the trees. Naturally, the significance of the events don't become clear until the end, but it still made for gripping Stone Age action. Thus far in the series, I've been of the opinion that the story and characters are great but nothing actually happens. Well, The Master of Heathcrest Hall totally did a 180 on the action front. Tons of things went down in a dramatic fashion, and in some parts I couldn't turn the pages fast enough. There were mornings when I had to (reluctantly) wrench the book away so I could finish getting ready for work. It's difficult for me to say what actually happens without potentially spoiling the plot. Suffice to say that some of my predictions came true and some didn't. There were a lot of plot threads going on that had to be wrapped up, and most of them satisfactorily did. Much to my pleasure, the one I deemed most important to the overall series was saved for the very last few pages. Yes, that's right. I spent the book swooning over Mr. Rafferdy. 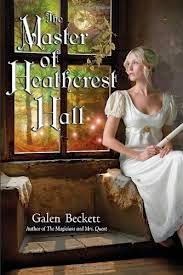 He had big-time character growth over the series but in The Master of Heathcrest Hall he pulls a Mr. Darcy and becomes wiser and more selfless, while still being awesomely snarky. Jane Austen fans will note that the primary romance bears a striking resemblance to Pride and Prejudice, albeit with feminism and gay rights and evil ancient aliens. Really, what more could you ask for? This is a trilogy well worth the huge time investment - a pleasure from start to finish.